DiBiase Heating & Cooling Company provides air conditioning, heating and water heater services to our neighbors in the Chadds Ford, PA areas. Since we opened our doors in 2008 we have lived by a code of integrity, honesty and quality. Your complete comfort is our #1 priority. Read our reviews and find out why your neighbors consider us to be their local partner for quality heating, air conditioning and water heater services in Chadds Ford, PA. Performed precision a/c tune up on a/c systems. 3 mini splits, one with 2 indoor heads. Washable filters were clean. Performed a/c tune ups on 4 trane a/c systems. Replaced 3 Aprilaire 213 air filters and 1 16x25x1 air filter. Blew out all condensate drains and tested pumps. Also checked all electrical conections and components. Checked refrigerant pressures and temperatures, all systems working fine at this time. Discussed with customer issues with Honeywell steam humidifier that is mounted remotely in laundry room and piped to central system in attic. Measured humidity at thermostat at 58% and thermostat reading 45%, need to recheck at time of maintenance to confirm reading. Unit is wired to only come on when heat is on. 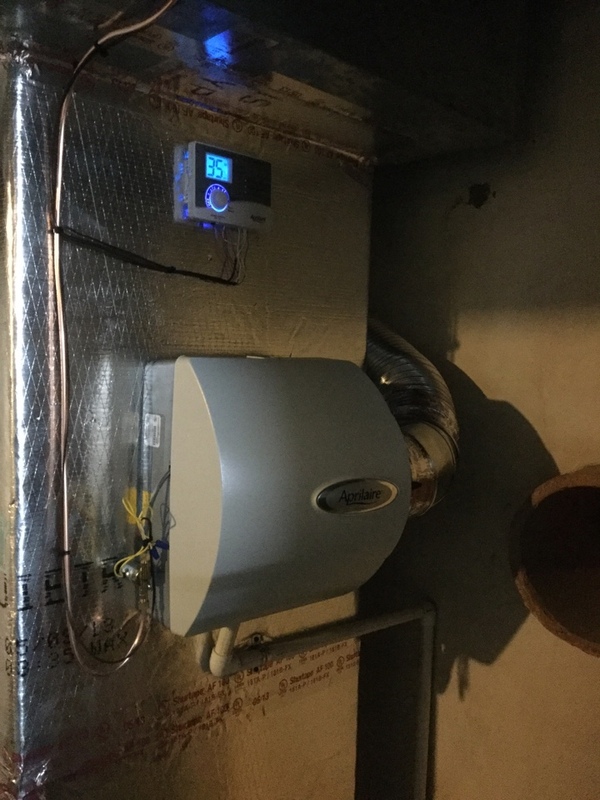 Customer would like price for new Aprilaire steam humidifier and service plan and checking out Honeywell steam humidifier for obvious signs of problems and wiring. Informed customer we can check Honeywell humidifier as a courtesy if he starts service plan. Performed Precision Heating Tune Up on Trane Heat Pump System. Replaced 20x22x1 Air Filter. Inspected Electrical Components on the Air Handler and Heat Pump. Performed Humidifier Service and opened all Dampers. Humidifier is turned on at the Thermostat and is set to 38% Humidity. Measured Refrigerant Charge on system and tested Electric Heat Kit. System is operating to standards at this time. 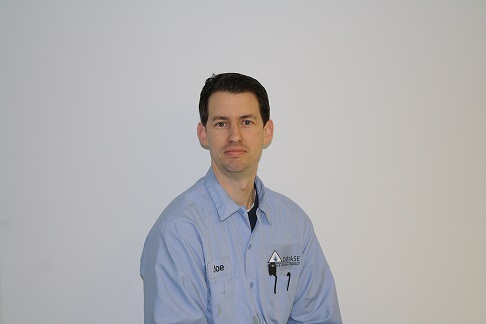 Install ECM Motor Surge Protectors in each Air Handler and on the Propane Gas Furnace. 11/8/18. Installed 4 ECM MOTOR PROTECTORS, VERIFIED OPERATIONS. Customer will call with payment. Performed Precision Heating Tune Ups on the 3 Heat Pump Systems, the High Efficiency Boiler, the Gas Furnace, and the Mini Split Heat Pump system which supplies the two children's bedrooms. All Air Filters were changed and the Air Filters on the Mini Split Units were cleaned. Serviced the two Humdifiers and tested operation. All Dampers are open and both Humidistat controls are set to the recommended level 5. Checked Refrigerant Charge and Auxilary Heat on the Heat Pump Systems. Put Systems in Forced Defrost to ensure they were switching over properly. Performed Combustion Analysis on Furnace and Boiler. Found the Air Handler for System 2 which is in the Basement crawl space had growth and mold forming inside of it and on the Wiring. Possible solutions could be to install an Air Scrubber Air Purifier into the system.The 3 Air Handlers and the Propane Furnace all are equipped with ECM Blower Motors. A safety enhancement to these systems would be to install ECM Motor Surge Protectors. Performed Precision Air Conditioning Tune Up on system. Replaced 20x22x1 Air Filters. Cleaned Condensation Drain Pipe. Closed Humididifer Damper for the Air Conditioning season. Tested Refrigerant Levels using a Charging Jacket due to lower Outdoor Temperature. Cleaning the Heat Exchanger on a High Efficiency Ulta Boiler in Chadds Ford as part of the Heat Tune Up. 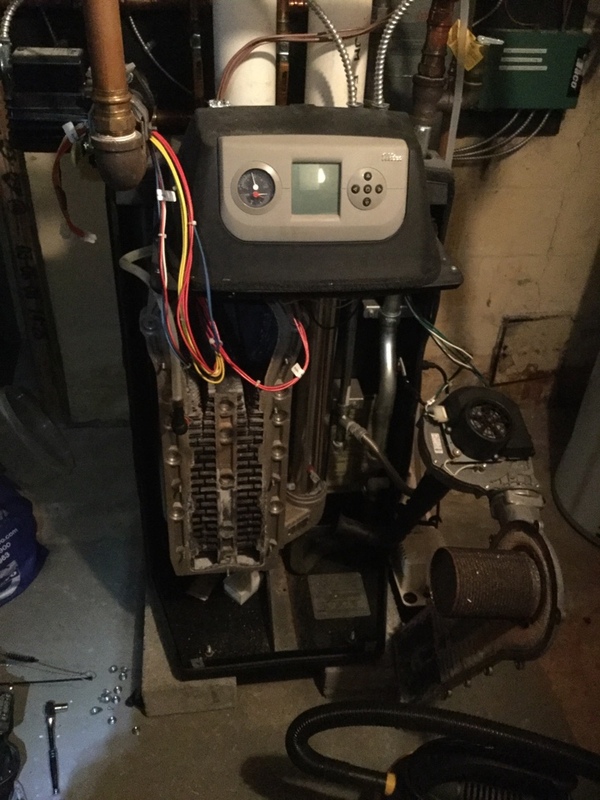 This home has multiple systems which along with this Propane Fired Boil, include a Rheem Propane Gas Furnace, several Trane Heat Pumps, and three Mitsubishi Mini Split systems. 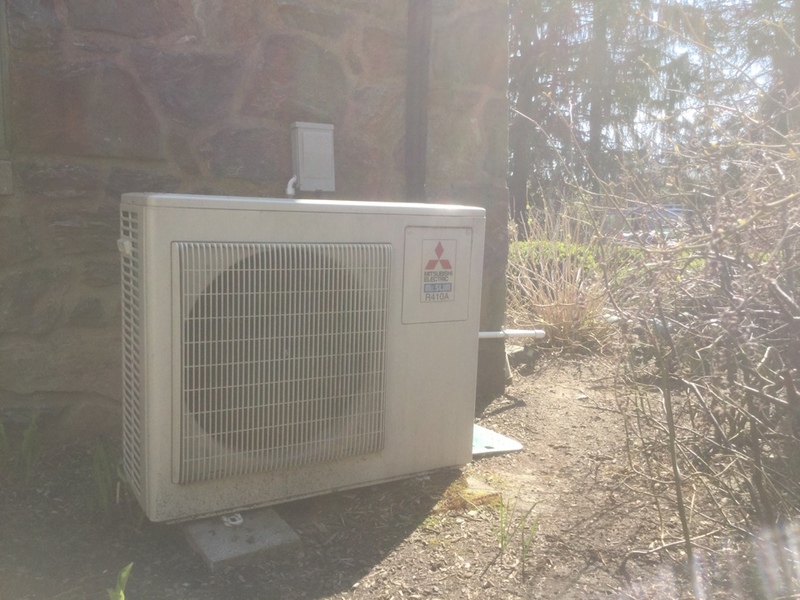 Performing Air Conditioning Tune-Ups at a home in Chadds Ford that has multiple Heat Pump and Ductless Mini Split Systems. Installing a new Aprilaire Humidifier on a Trane Heat Pump System in Chadds Ford.